After the speakers, we began to march. The protest wound its way through the streets of Manhattan followed by dozens of cops. I overheard one of them on his cell phone, a tall, distinguished white man in uniform urging his peers to “hurry up and get ahead of this group; we need you in front of us right now. This needs to stop.” The policemen kept appearing seemingly out of nowhere, making several arrests on foot and on motorcycles, in vans and in cars until we came to a pause in Herald Square, when the number of officers seemed almost equal to the remaining number of marchers. By then, nine protesters had been arrested. If we were to continue, we did so autonomously and at our own risk, the organizers told us. I followed the remaining group to Times Square, where a line of policemen awaited us, blocking our progress. It was there we learned that the protests in Charlotte, NC had grown violent, and that someone had been shot. The group marched on through the streets. I returned home and ate a sandwich. In my experience of being Asian American, there is a deep and insidious history of anti-blackness and also a culture of respecting my elders. The latter certainly affects my ability of confronting the former, though it can also be chalked up to my lack of gumption, my lack of integrity. Innumerable are the times my family and friends have made racist remarks in my presence; I can probably count on one hand the number of times I have, in the moment, corrected them. Their misplaced comments are often born out of ignorance–or worse, a desire to overcome our own societal handicaps as a marginalized minority. And because I understand the intricacies of that position and because I love them to distraction, I say nothing. I do nothing. The movement for true justice and equality requires more from us, requires us to be better. At the few NYC Shut it Down rallies and protests I’ve attended, they have been extraordinarily inclusive, presenting speakers from Native, Latinx, queer and trans groups, insisting that when we say “Black Lives Matter,” we don’t just mean black male lives but everyone the system leaves behind. It shouldn’t take tragedies for us to take up the mantle. It shouldn’t take tragedies for us to organize our communities against injustice. For me, though, it does. I entrench myself in these issues only while it is fresh, while there are new bodies to count. In the interim months, my activism lies dormant. Many of my peers’ activism lies dormant. We gather again when there is another hashtag, ignoring systemic failures when it’s convenient for us. Educate myself and those around me. Though it’s not ideal, sometimes the way into racial politics for Asian Americans includes examining our own, often undocumented histories of oppression, and sources like Asian American Studies Now and Asian American Dreams can help with that. However, my focus will be in studying black writers: bell hooks, Audre Lorde, Cornel West, James Baldwin, and Angela Davis, among others. A place I’m starting is this Black Lives Matter syllabus from New York University: it’s a pretty thorough resource that includes texts, films, and lecture-style videos. Speak up. That especially includes speaking with people close to me who might not understand the nature of their microaggressions. 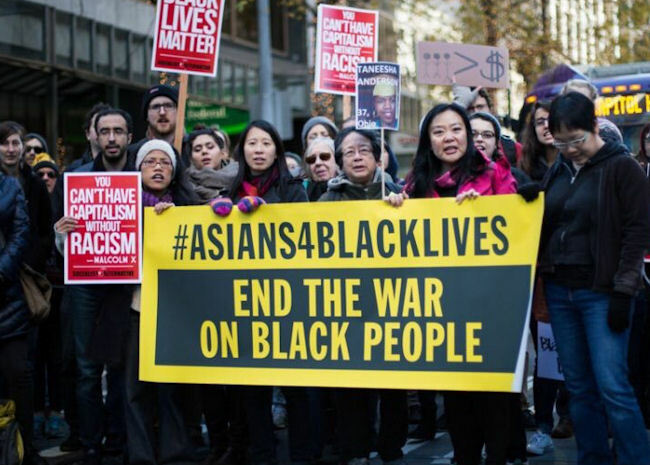 This open letter written by Christina Xu in collaboration with dozens of contributors can be useful in sourcing language to talk about police brutality specifically within Asian and Asian American spaces. Police my own language and appropriation. As Kel Kray writes, “consumers hold a long record of engaging with black culture solely for entertainment while remaining wholly removed from acting in support of lived black lives.” I resolve to love Beyonce with abandon; I resolve to abandon African American Vernacular English in conversation (including seemingly innocuous phrases like “Yas kween,” popularized among white people by TV show Broad City.) Blackness is not a commodity or a fun thing to try on. That doesn’t mean I leave the Beyhive; it means I don’t take up space in black spaces. Get out on the streets and follow black leadership. I will continue to protest peacefully. Tweeting and posting in solidarity is nice; being with a crowd of like-minded individuals is both proactive and more visible to the public. During the march this past week, there were a couple very vocal white men in the crowd, and I overheard a conversation about how the event felt “co-opted.” I can best support the movement by following the intent and wishes of black community organizers. Put my money where my mouth is. Writer Shaun King of the New York Daily News is currently calling for an economic boycott to end police brutality; I will support that as details emerge. I will also boycott Black Friday and support local black-owned businesses. I can also donate to grassroots movements like NYC Shut it Down, local chapters of Black Lives Matter and similar organizations, and the families of victims like Terence Crutcher and Keith Lamont Scott. Examine my political candidates and their policies. Resources like Ballotpedia can help compare candidates’ proposed policies; most candidates also list a thorough view of their policies on their websites. I resolve to vote for candidates with police reform on the agenda and especially to turn out for and research my local candidates, who influence what local policing actually looks like. Be inclusive. Black lives matter doesn’t just mean black men: it means black and brown women, trans, and gender-nonconforming people who are at the intersection of racism, sexism, queer and transphobia. Being intersectional in my activism is the only true way I can fight injustice in America. Kaela Mei-Shing Garvin is a Brooklyn­-based writer, producer & performer. Founding member of Undiscovered Countries, co­-creator of original series 2 Girls | 1 Asian. 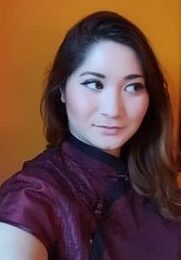 Her essays have been published on PCP Media and Lady Parts, a feminist blog highlighting sexism in the entertainment industry; she is a writer for upcoming series BKPI created by Hye Yun Park.